4Videosoft iPhone 4S Transfer Ultimate is such comprehensive and multi-functional iPhone 4S transfer software to transfer music, movies, ringtone, ePub, PDF, camera roll, picture, camera shot between iPhone 4S and PC. It is also capable of transferring TV shows, podcast, iTunes U, audio books, voice memos, SMS and Contacts. Moreover, it allows you to transfer files between different Apple devices directly. This iPhone 4S Transfer Ultimate can help you convert DVDs, videos and audios to iPhone/iPhone 4S video and audio formats. And it can act as the iPhone ringtone makers for you to create your personalized ringtone for your iPhone 4S. 4Videosoft iPhone 4S Transfer Ultimate can transfer iPhone 4S music, movies, TV shows, podcast, iTunes U, ringtone, ePub, PDF, audio books, camera roll, picture, voice memos, camera shot to computer for backup. This iPhone 4S transfer Ultimate enables you to add various local video, audio, photo and other files to iPhone, iPhone 4S, iPad, iPod, etc. You can also export iPad, iPhone, iPhone 4S, iPod files to iTunes. This iPhone 4S Transfer Ultimate totally supports iTunes 10.6 and iOS 5.1. With the iPhone 4S Transfer Ultimate, you can directly transfer files between various Apple devices for special purpose. This iPhone Transfer Ultimate can help you transfer iPhone 4S SMS to computer for backup. You can also delete the unwanted SMS from the backup file. It is easy for you to backup iPhone 4S and other iPhone Contacts to local disc. 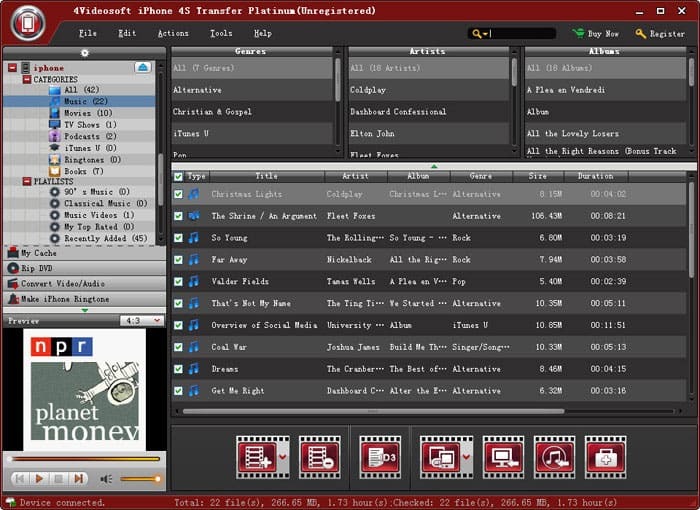 The Transfer provides you with the function of converting DVD and video files to iPhone 4S and other apple devices. This iPhone 4S Transfer Ultimate also offers you the simple editing functions for you to optimize your output video, such as modify video effect, crop video frame, clip video length and add watermark.